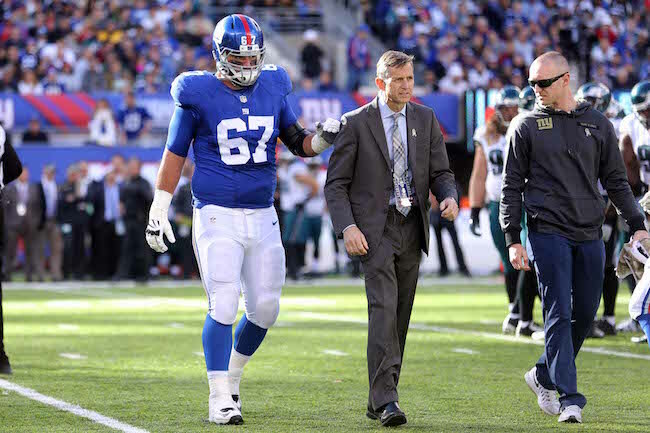 The Giants announced on Thursday that offensive lineman Justin Pugh will soon be placed on Injured Reserve. Pugh missed the November 5th game against the Rams with a back injury, aggravated the injury the following game, and has been out since. Pugh ended 2017 playing in just eight games, three at left guard and five at right tackle. The good news is that Pugh will not need back surgery, as rest and rehabilitation is being prescribed by doctors. The injury-prone Pugh has not played a full 16 games since his rookie season in 2013. He missed two games in 2014 with a quadriceps injury, two games in 2015 with an ocular concussion, and five games in 2016 with a knee injury. Pugh is scheduled to be an unrestricted free agent this offseason. The transcript of Kevin Abrams’ press conference on Thursday is available in The Corner Forum. Wide receiver Roger Lewis (ankle) and offensive lineman Justin Pugh (back) did not practice on Thursday. Wide receiver Sterling Shepard (hamstring), wide receiver Travis Rudolph (hamstring), tight end Rhett Ellison (finger), defensive tackle Damon Harrison (not injury related), linebacker B.J. Goodson (ankle), cornerback Brandon Dixon (heel/hamstring), safety Landon Collins (ankle), and safety Nat Berhe (hamstring) practiced on a limited basis. Defensive end Jason Pierre-Paul (finger) fully practiced.